Instapaper gets location based background auto update, your news is always fresh! Cool feature, but be forewarned it only works on iPads that have cell network connections (WiFi only iPads not supported). The ‘feature’ is GeoFencing, which is to say that your iPad bases it’s location from it’s cell tower connection and does an action based on going in or out through the ‘fence’. Apple doesn’t allow automated things to happen with apps without your knowledge in the background. You can kick off a process and leave the app, via multitasking the app will continue to work. But, the app it’s self isn’t support to start that action without you telling it to. 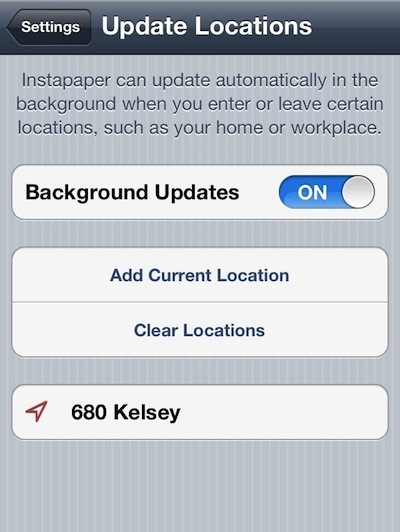 Instapaper uses a feature developed by the New.me folks called Background Update Locations. If you have an iPhone or iPad with 3G/4G support, go to the settings area of Instapaper. The last option in the boxed area that started with ‘Rotation’ will be the ‘Background Update Locations’ (won’t even show if your on a WiFi only iPad or iPod Touch), selecting that you will be asked to allow your location to be known by Instapaper. Of course, you must say ‘Yes’ for the feature to work. If you choose ‘No’, you will need to go to the iPad’s Settings – Location Services – scroll down to Instapaper and move the slider over to ‘On’. Once you say Yes to the Location Services in the app, you will be given you current location. Choose up to 10 locations you will want Instapaper to update the Read Later articles to your iPad when you enter/leave that location. The action should happen automatically for you so now when you save a Web page article to Read Later on Instapaper, you don’t have to remember to sync that article within Instapaper before going into an Offline area, it’s done for you. The Instapaper developer states that the feature/locations keeps the information within the apps and the data is never sent to the service’s servers. The below screen shot is of the feature set up in the Settings area of Instapaper on an iPhone, the company doesn’t provide us with 3G/4G iPads.